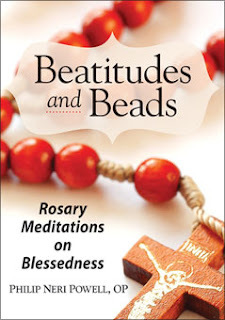 The booklet contains an original rosary with prayers and meditations based on the Sermon on the Mount. It is available in English and Spanish. Each booklet is $2.50 . Buy in bulk and give them as gifts! All the royalties from this booklet go to my province. You can read my review of one of Fr. Philip's other prayer books here and a sampling of one of his prayers here. I love the beatitudes. I need to order this booklet. I missed this post yesterday. At any rate...I'm thinking that these would be wonderful little additives to Christmas presents this year...for grandparents, aunties and uncles, anyone. Thanks for sharing.